The next time you come to New Orleans, you’re not going to want to spend all your time indulging in the delicious food and sucking down the decadent cocktails, are you? Okay, maybe don’t answer that. No, while you will definitely want to dedicate plenty of time to those pursuits, taking a tour is a great way to change things up on your trip and learn a little a bit about the city and the region in the process. As New Orleans is known to get a little nutty every now and again, these are five of the craziest tours in New Orleans you should consider on your next trip. 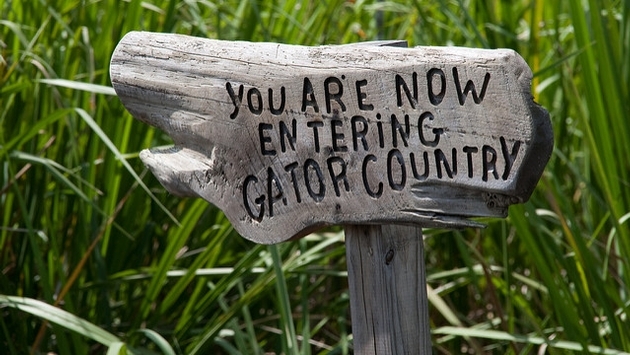 Getting cozy with alligators may seem a little crazy somewhere else, but not in New Orleans. Taking visitors on a spin through the nearby bayous, Cajun Encounters swamp tours are a great way to learn about the fragile ecosystem of the wetlands, Cajun culture, and see some of those scaly swamp beasts up-close-and-personal. You’re also bound to spot plenty of other wildlife and a bevy of the bayou’s signature cypress trees hung with moss. New Orleans’ French Quarter has been the scene of countless tales of treachery and things that bump in the night over the centuries, with many regarding the district as one of the most haunted places in America. A ghost tour is the best way to learn more about this haunted history, as they guide you through the district, pointing out specific haunting places and the lurid details of the deceased that led to the haunting. Due to the fact that most of the city is built on swampland, New Orleans had to get creative in the cemetery game. This resulted in a set of above-ground cemeteries filled with rows of hauntingly beautiful crypts and mausoleums adorned with ornate artwork and statues. These cemeteries are like small cities and hence have garnered the nickname ‘Cities of the Dead.' A 'Save Our Cemeteries' guided tour is a great way to learn all about them and spot a few famous crypts along the way, including Marie Laveau’s, the legendary queen of voodoo. If your interest in voodoo is piqued by visiting Marie Laveau’s grave, then the natural next step is to take a voodoo tour like Free Tours By Foot Voodoo Tour. Tracing voodoo’s journey to New Orleans from its roots in West Africa and detailing the true beliefs of its adherents, these tours attempt to separate the fact from Hollywood-fed fiction. You’ll learn plenty about this religion, including the surprising number of New Orleans residents who still practice it. If you’re wondering, yes, there will be voodoo dolls. There aren’t many places that take their libations as seriously as New Orleans, Louisiana, and on a cocktail tour, you’ll learn about a few of the city’s signature pours, as well as its unique cocktail culture. Concoctions like the Sazerac, Ramos Gin Fizz, and the Hurricane were born here, and they all have a fascinating backstory. Not a rowdy pub crawl, a cocktail tour like Drink & Learn in New Orleans is more like a sophisticated cocktail stroll.